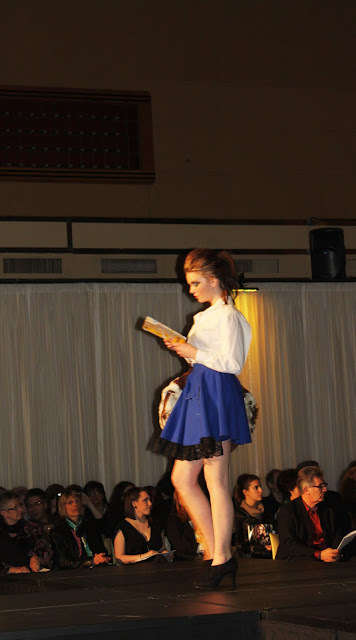 A couple weeks ago, I attended the Emerge 2011 fashion show hosted by the school of fashion studies at George Brown college. The show was at the Design Exchange in Toronto and I was invited by Not A Model reader and fashion student Tarah K. At the show, I was blown away by the detail and dedication that went into each collection. The scenes were broken down into different categories from daywear to lingerie to street scenes. I could feel the energy in the room as you always can when you are surrounded by people who are passionate and proud of what they do. I especially loved Tarah's mini collection (photo 3) with the amazing tulle skirts and crinoline hoops. Her designs made me want to scoop my hair up in a pony and drink a strawberry milkshake. That's the thing about fashion, it can evoke the most real desire and images in people who allow themselves to fall in love with it. Congrats to all the students for a fantastic night and a bright future ahead!